During the show's opening teaser, after Olbermann previewed stories about McCain's political association with controversial pastors John Hagee and Rod Parsley, the Countdown host continued: "On renouncing Rod Parsley, John McCain remains silent, as he does on the new GI bill. It passes the Senate. Obama, aye. Clinton, aye. McCain, awol. He didn't show up." After getting to the story of the Senate vote, Olbermann charged: "Senator 'I Support the Troops' today supporting himself instead of the troops, but still managing to play political opportunism with one of his opponents who actually showed up for the vote." 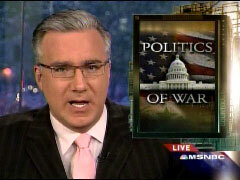 After relaying to viewers that McCain and the Pentagon both oppose the current version of the GI bill because they "believe the full tuition benefit is too expensive, and that offering it after only three years of service would encourage service members to leave the military after just one enlistment," Olbermann played a clip of Obama criticizing McCain's opposition to the bill, accusing McCain of "political posturing" with regard to "giving our veterans the chance to go to college." After reading McCain's statement reacting to Obama in which the Arizona Senator remarked that Obama "did not feel it was his responsibility to serve our country in uniform," Olbermann came to Obama's defense as he mocked McCain as being at the "front lines" of a fund-raiser in California. 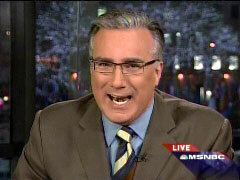 A few weeks ago, on the May 2 Countdown, Olbermann thought it amusing to scold Ann Coulter for calling Obama a "Manchurian candidate" suggesting that doing so would be disrespectful to McCain, even though it was Olbermann himself who made the comparison between The Manchurian Candidate and McCain: "Are you sure you want to go there when the movie The Manchurian Candidate was about a presidential election and an American war hero POW who'd been brainwashed in Southeast Asia? ... Now, given who is in this year's presidential election, why on Earth would you or any conservative or Republican want to invoke The Manchurian Candidate and get people drifting off into the science fiction of POW presidential candidates who were brainwashed in Southeast Asia?" KEITH OLBERMANN, IN OPENING TEASER: On renouncing Rod Parsley, John McCain remains silent, as he does on the new GI bill. It passes the Senate. Obama, aye. Clinton, aye. McCain, awol. He didn't show up. BARACK OBAMA CLIP #1: I respect Senator John McCain's service to our country. OBAMA CLIP #2: But I can't understand why he would wind up behind the President in his opposition to this GI bill. OLBERMANN: McCain responds with a statement accusing Obama of taking "easy advantage of an issue he has less than zero understanding of." The statement issued as McCain attended a fund-raiser in California. OLBERMANN, AT 8:21 P.M.: The choice today for Senator John McCain having been a very simple one. He could have returned to his day job on Capitol Hill in order to support the troops by supporting a GI bill that would guarantee full college scholarships for those who serve in the military for three years, or he could travel to Silicon Valley to attend a $25,000 a couple luncheon to support his own campaign's bottom line. Our fourth story on the Countdown, Senator "I Support the Troops" today supporting himself instead of the troops, but still managing to play political opportunism with one of his opponents who actually showed up for the vote. Mr. McCain missing the vote on the GI bill this afternoon, as well as the Petraeus-Odierno confirmation hearings, in order to attend two high-roller fund-raisers in California, not that he would have voted for the measure anyway. The Arizona Republican opposing this GI bill, as does the Pentagon, because both believe the full tuition benefit is too expensive, and that offering it after only three years of service would encourage service members to leave the military after just one enlistment. Senator Clinton voting yes for the amendment, also putting in time at the promotion confirmation hearings for Generals Petraeus and Odierno over at Armed Services, a committee on which she and Senator McCain both sit. Senator Obama, also voting yes, criticizing McCain for his opposition. OBAMA CLIP #1: I respect Senator John McCain's service to our country. He is one of those heroes of which I speak. But I can't understand why he would wind up behind the President in his opposition to this GI bill. OBAMA CLIP #2: There are many issues that lend themselves to partisan posturing, but giving our veterans the chance to go to college should not be one of them. I am proud that so many Democrats and Republicans have come together to support this. OLBERMANN: How many Democrats and Republicans coming together? 75, versus only 22 against, what would be a veto-proof majority. Senator McCain firing back against Obama's criticism: "Unlike Senator Obama, my admiration, respect and deep gratitude for America's veterans is something more than a convenient campaign pledge. I will not accept from Senator Obama, who did not feel it was his responsibility to serve our country in uniform, any lectures on my regard for those who did." That in a written statement coming from the front lines of McCain's California fund-raisers. 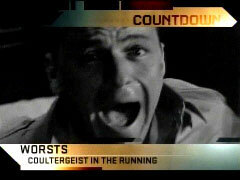 KEITH OLBERMANN, IN OPENING TEASER: Worst Persons: Coultergeist didn't think this one through. "Is Obama a Manchurian candidate?" she asks. Are you sure you want to go there when the movie The Manchurian Candidate was about a presidential election and an American war hero POW who'd been brainwashed in Southeast Asia? OLBERMANN, DURING WORST PERSON SEGMENT: But our winner is Coultergeist, and not for the reasons you would think when you hear her quote: "And I guess the question is, is Obama a Manchurian candidate to normal Americans who love their country, and he secretly agrees with the Weatherman and the Reverend Wright faction? Or is he being the Manchurian candidate to the traitor wing of the Democratic party?" You got to stop chain-chewing that Nicorette, Ann. The reason for this award is not the either/or -- is he evil or is he evil -- question about Obama. It's the Manchurian candidate reference interjected yet again into this presidential election. Annie, have you ever seen The Manchurian Candidate, the classic original with Frank Sinatra and Lawrence Harvey? The Manchurian Candidate is about an American war hero, ex-POW, who, while he's in captivity, gets brainwashed by the Chinese. Now, given who is in this year's presidential election, why on Earth would you or any conservative or Republican want to invoke The Manchurian Candidate and get people drifting off into the science fiction of POW presidential candidates who were brainwashed in Southeast Asia? Ann, "just say oops and get out" Coulter, today's "Worst Person in the World!"